Have you ever felt a lightbulb go off in your mind after being stumped for days about something? Or maybe you intuitively were drawn to a certain decision all of a sudden, as if someone else was telling you the right thing to do. If you’ve ever experienced an “inner knowing” about something, it might have actually been your universal guides pointing you in the right direction! Guides can come to you at any time and for any reason, especially if they know you’ve been struggling and need guidance in your life. They can appear in all sorts of ways, usually through signs and a gut feeling you get when they’re trying to get in touch with you. We’ll go over some surefire ways to know if the universe is trying to communicate with you. One of the most telling ways that the universe talks to you is through synchronicity. What is this, you ask? Well, it basically means that everything just falls into place, the puzzle pieces start coming together, and you start feeling like you’re on the right track. Two events occur that have no causal relationship, yet seem to be related in a meaningful way. For instance, maybe you’ve been going through a breakup, and “Since You’ve Been Gone” by Kelly Clarkson blasts through your car speakers right when you turn the radio on. Or, let’s say you have been feeling lonely, and one night, an old friend calls you up out of the blue to say hello. These events can happen at any time, so pay attention. Your universal guides just want to help you out and get you back on the right track. Especially pay attention to numbers, specifically repeating ones. Many mystics believe that seeing 11:11 on a clock, for instance, means your angels are watching over you. If you meditate, you probably do it to quiet your mind and simply “turn off” the outside world for a while. However, did you know that this is one of the most popular ways to communicate with your guides? When you meditate, you start to increase your vibrational frequency, which literally takes you to greater heights, both spiritually and mentally. Guides operate on higher frequencies as well, which means you’re on the perfect road to cross paths with them. If you feel something “pulling” at you in your meditation practice, it might be your guides trying to contact you. Guides love to talk through dreams, because it’s almost like you’re in another world entirely, which makes it easier to contact you. Plus, dreams can get pretty vivid and intense, which allows the guides to use the full spectrum of creativity to convey their messages. They might send you someone in your dreams that you are destined to meet in real life, or show you an image of you in the future. Your dreams are important, so keep a dream journal nearby so you can jot down your dreams when you wake up. You’ll likely have dreams that you can directly apply to your life to help you on your journey. How many times have you felt like you just couldn’t catch a break? It happens to all of us, but if we look deeper, there’s a message within the madness. If it just won’t stop raining, maybe our guides want us to change direction, or learn to change our attitude. Challenges help make us stronger, but they often show us that we should change our path since the one we’re on seems to be littered with roadblocks. 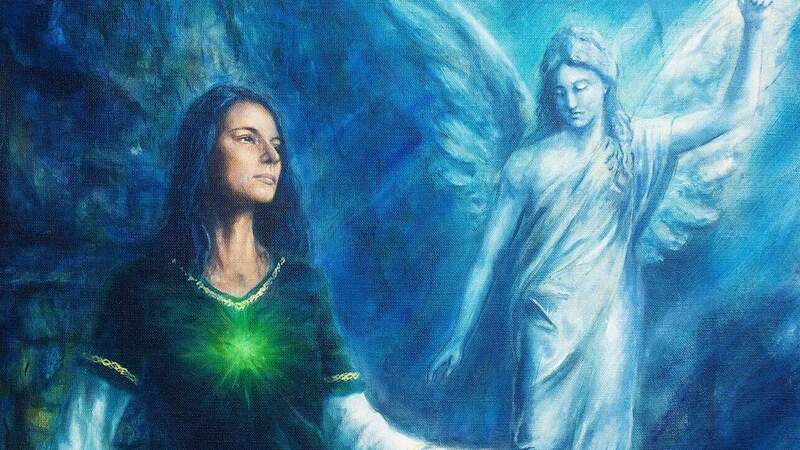 One way to know if your spirit guides are near is to pay attention to your intuition. Maybe you have a date coming up this weekend, but something doesn’t feel right in your gut. This means that the universe is trying to tell you that the person either isn’t right for you, or that you could be in danger around this person. If something feels “off” to you, that’s your intuition trying to warn you about possible threats. On the flipside, your guides could also show you something positive in your life that you might’ve overlooked. Maybe you have some job opportunities lined up, and you suddenly feel drawn toward one more than the others. Your guides only want to help you, so keep your senses aware of their presence. The universe talks to us all the time; we just have to quiet our thoughts and tune into its mysterious ways of communicating. So, pay attention to the signs all around you, because it just might be your guides trying to illuminate your path and help you steer clear of things that no longer serve you.